I must be missing something, but I can't find any controls to change the default top-menu choices and drop downs in the header builder that would allow me to make changes to the actual content of the standard/left header, after duplicating it and renaming it. Just styling options with no obvious indication of how to change the menu options to reflect the actual structure and content of my site. I don't have a "shop" or "projects." Where do the controls live for changing these what these items say and do, rather than how they look? Apex, I understand this isn't the most exciting question but it's pretty important. I read the Pro header introduction link posted in every thread about the header builder. Neither the video or the KB article has any discussion about what controls the actual entries in the menu header are being autobuilt from. where are "shop" and "project" coming from? there are no pages in "content" with those titles. I though they were placeholders in the header builder, I did not expect them to go live on my site, replacing the working header that was there. 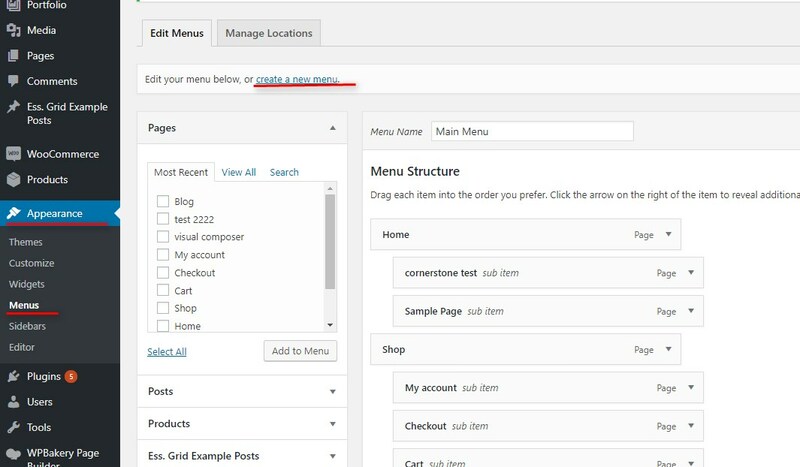 if the menu structure and options being displayed by the Standard Left header, copied, edited and applied globally through the X-Pro Header Builder, are not coming from the same "Top Menu" hierarchy in nav-menus.php that the classic header used -- then where are they coming from? The Top Menu hierarchy (set to Primary Menu) that I see in the left pane if I go into Customizing > Menus > Top Menu is not what Pro is displaying in its Header Builder produced menu. Yet, there's no obvious place to do this in Pro's edit mode if the previous Top Menu/Primary Menu configuration in WP settings outside of Pro is being ignored. OK, after much head-scratching and doubting of my sanity I found it. It's in the "setup" pane in Pro's editor when the "Navigation Inline" item is selected. The Assign Menu dropdown lets you select the "Menu: Top Menu" option (or whatever else you use) to get your structure back. Apex, this may seem obvious to you but I urge you to document it prominently somewhere. Maybe in a KB article called "How Do I Set My Header Menus Inside Pro?" That'd be excellent. Sorry If we did not get back to you on this immediately, that is because you're bumping up your thread and it getting pushback in the queue. Anyways, glad you found the Assign Menu option, it's on Navigation documentation actually. For others, whose having the same issue, please navigate to Appearance > Menus and create your menu. Then on your Navigation element, Assign the menu that you just created. Aha! Good to know that's how the queue works. It wasn't so much the response time that was getting to me, so much as that I knew it HAD to be a simple thing and not being able to find the setting or KB article on it was driving me up the wall! I do wonder why the default menu is Sample Menu when applied globally -- or why there isn't a modal popup that says HEY ARE YOU REALLY SURE YOU WANT TO APPLY THE FAKELOGO & SAMPLE MENU HEADER GLOBALLY -- but I guess Pro isn't meant to do a lot of hand-holding. A warning isn't needed because you would naturally look at the preview if you're designing / configuring your header. You can also design a header without publishing it by not assigning it globally or any page. It would be best you read the documentation of the element if you're not sure. Assigning a menu was described in the Navigation Inline documentation.